S moans that Bologna is an expensive city, but has he seen the shoe shops here? No, of course he hasn’t, because he’s always too busy stuffing his face in restaurants and making whimpering noises about the egg-rich, yellow pasta that is so typical of this region. Emilia Romagna has long been one of the wealthiest areas in Italy, and this prosperity is reflected in the lavishness of many of its dishes and preparations. The best known, of course, is Bolognese sauce, or ragu, which cookery writer Anna del Conte describes as the perfect example of Bolognese cooking. It is, she writes, rich yet well balanced, lavish and yet restrained, meaty and yet fresh. I like that in a dish. And also in a man. Meanwhile, in her new cookery book, published in May 2007, Connaught head chef Angela Hartnett gives her excellent recipe for ragu. Hartnett's family originate from a village in the region called Bardi, and she insists that the meat for the sauce (a mixture of chuck steak and veal rump) is finely chopped, not minced, because it tastes so much better. At Ristorante Diana, the ultimate showcase for traditional Bolognese food in Bologna, the meat in their sauce is always chopped. Here, the sauce has a rich intensity that suggests the dark, meaty presence of other ingredients - such as liver - deep in its midst, and it is served with a pile of the yellow tagliatelle that they make on the premises. S loves this restaurant so much he has been known to come here for lunch, then straight back for dinner in the evening. If I turn my back for a second in the handbag section of the nearby branch of Furla, he will scurry back here to his favourite table like something released from a catapult. 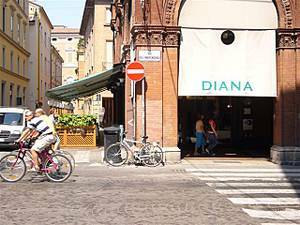 When we return to Bologna – and we do, a lot – he always says; I’m not going to spend all my time in Ristorante Diana again. Then when we get here, it’s impossible to prise him out of the place. Locals might tell you that Diana has seen better days and perhaps it has, but eating here is still special. Particularly if you want to taste proper, old-fashioned Italian cooking, rooted in the culinary traditions and history of the area. The restaurant is split into two rooms (try to book in the front one) and in the summer opens a little outside terrace. 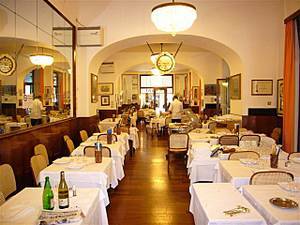 The décor, with its ancient clock, curved mirrors and squeaky metal trolleys, looks like it hasn’t changed a lick since Mussolini was in power, while the army of Diana waiters wear cream jackets, black ties and myriad expressions of comic, deep sufferance. More cheerful still is the dessert display, like something from nonna’s Christmas kitchen, with freshly baked cakes, some torta di riso, spiced pears, bowls of tiny fragoline di bosco (wild strawberries) and rum babas soaking innocently in huge glass jars, their alcoholic syrup potent enough to stun a regiment. Amongst the many specialities of the house are the roast meat and the boiled meat trolleys. The first has a selection of birds and joints which are freshly roasted during the day then simply served, perhaps with a few sauté potatoes and green beans. The drum trolley of mixed boiled meats - the famous bollito misto - is a hugely popular local tradition. A succulent selection of, usually, boiled tongue, chicken, beef shoulder, veal breast and cotechino sausage is served with a srinkle of meat broth, a ladle of lentils, some salsa verde if preferred, or perhaps the hot thwack of mustard fruits. It’s worth coming here just to see the local businessmen tuck into their bollito misto with the same relish their fathers and grandfathers no doubt did, and to watch the boiled trolley man lever up the interior meat tray as if dredging a swamp. Other local specialities include a meat paste made with pulverised mortadella and served with toasted white bread, of which I am inexplicably fond. Don’t miss the tortellini in a clear, sparkling brodo, or the homemade ice cream served from metal canisters which are so cold that vapour rises off them as they are brought to the table. The ice cream, like the tagliatelle, is made with Italian eggs with rich, sunset yolks which give a pleasing, saffron hue to everything they help produce. S adores a few big scoops of this, with Ristorante Diana’s glossy, dark chocolate sauce poured on top, cracking over the cold ice cream as it settles into the chilly folds. It’s always cheerful in here, and good value too. You will get a nicer table if you book. Elsewhere in Bologna there are certainly lots of posh and Michelin starred restaurants, such as Battibecco, Franco Rossi and Pappagallo but they tend to be overpriced and serve the kind of bland, international Italian food that you get in London - or indeed, elsewhere in the world. So for dinner, S prefers Rodrigo, which he likes to describe as the Ivy of Bologna, which I don’t think it entirely deserves, but there you go. Rodrigo certainly is glitzy, but in that low-key Italian way where all the sparkle tends to be on the diamond-studded fingers of the clientele rather than on the walls or light fixtures. Every night, pistol-packing bodyguards fork spaghetti near the front door, keeping an eye on their charges in the back of the restaurant. The room itself is lined with bottles, rather like a bodega, and the lighting is courtesy of an old Venetian chandelier. It is a discreet and traditional place, with glass cabinets displaying the fish and other supplies on the menu that day. The manager will make suggestions but the seafood salad starter is always wonderful; as is the ravioli stuffed with blue cheese and walnuts; and the sea bass baked in salt. The cooking is of a high quality, and nothing ever disappoints. A little like Bologna itself. RISTORANTE DIANA - VIA INDIPENDENZA 24 tel 0039 (0) 51 231 302. Closed Mondays. About £60 for two with wine. RODRIGO - 2/H VIA DELLA ZECCA tel 00 39 (0) 51 235 536. Closed Sundays. About £80 for two with wine.